Chickens, Hogs, and Manure Oh My…. Factory farms continue to expand across the country, but citizens aren’t taking this sitting down. In the past month, we received calls for help from communities in Georgia, Iowa, Idaho, Ohio, and South Dakota. We continue to do whatever we can to support citizens as they fight to protect their communities, homes, and local environment from the threats posed by factory farms when they move into an area. In Illinois, citizens of Schuyler County are actively organizing against a 20,000-head hog operation.SRAP’s Karen Hudson has been out front working to support these citizens, while calling out the Illinois Environmental Protection Agency for colluding with the industrial livestock industry at the expense of the welfare of Illinois Citizens. Karen wrote an op-ed called One Stinking Collaborationthat was published as a “Spotlight” piece in the Peoria Journal Star. In Gordon County, Georgia, citizens are actively organizing to enact county regulations against an onslaught of a mega poultry complexes and recently delivered a letter from the Johns Hopkins Center for a Livable Future to their County Commissioners that outlined health concerns associated with emissions from industrial poultry facilities. In Howard County, Iowa, Iowans came together to oppose a Reicks View Farms hog operation, which owners are attempting to site on karst geoplogy, despite the serious threat this would pose to the community’s drinking water. In Oregon, there was a massive manure spill from a dairy that closed the Tillamook Bay to shellfish harvesting. This came at the same time that the Oregon Department of Agriculture approved a permit for the new 30,000-cow Lost Valley Ranch dairy in eastern Oregon to supply milk to the Tillamook Cheese company. At least one Oregonian is quitting Tillamook Cheese due to the factory farms supplying its milk. SRAP’s Chris Petersen has been working with citizens in Goodhue County, Minnesota to oppose a 4,700-head hog factory farm. Citizens there have set up a legal defense fund and are working hard to solicit donations to support their efforts. In Wisconsin, SRAP’s Lynn Henning and Scott Dye traveled to communities impacted by CAFOs to train citizens to monitor pollution runoff from factory farms. Neighbors of factory farms spent a day in the field learning how to become citizen scientists and watchdogs of the operations. Next month, Lynn and Scott are off to Delaware and Illinois to provide more tools to citizens actively working to keep their communities safe from factory farm pollution. For more information on SRAP’s Water Rangers program, visit our website. Until next month, be well, stand tall, and keep fighting to protect our rural communities from factory farm pollution. If you’re interested in seeing specific issues covered in our newsletter, send your suggestions to news@sraproject.org. You can read previous issues of our newsletter here. Maria Elena Bejarano never expected to have to pray for a breath of fresh air. She never expected to spend her days wondering if the thousands of cows next door were polluting her water, and she certainly never planned to go to battle against the corporate Powers That Be  to protect her family’s quality of life. Maria Elena moved to her home on the northern edge of Anthony, New Mexico in the seventies. Her kids enjoyed being outside and playing in the yard doing the type of things that kids like to do. 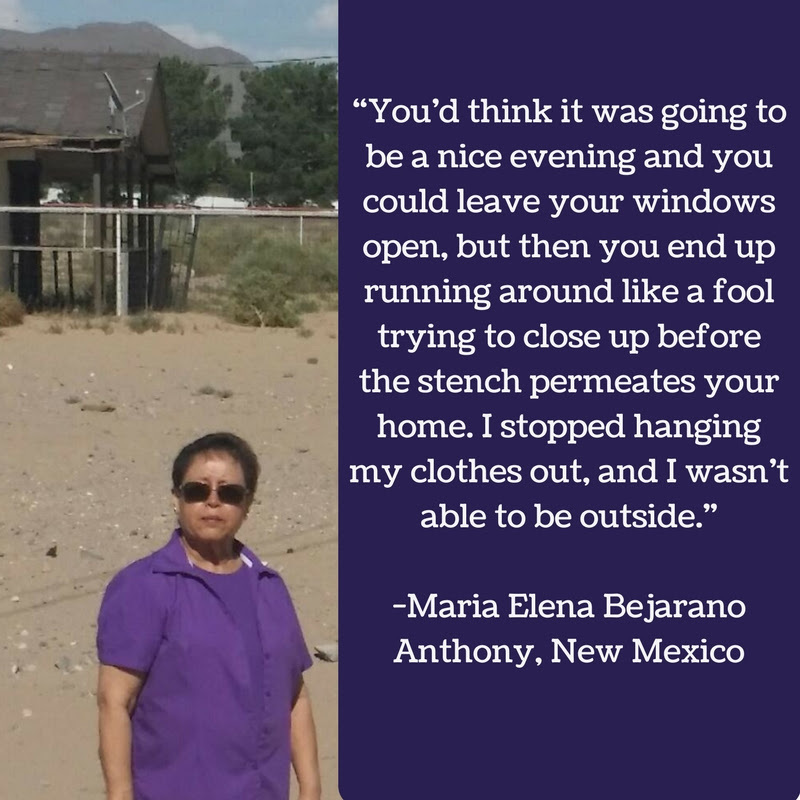 Maria Elena and her family had unknowingly settled at the southern point of a growing series of massive industrial livestock operations along Interstate 10 in New Mexico. The 10-mile stretch of road would eventually be ground zero for 13 consecutive dairy complexes, earning the nickname Dairy Row . Continue reading Maria Elena’s story here. Last week, the Michigan Less = More Campaign released a new report titled: A Watershed Moment. This report provides a one-stop shop for Michigan concentrated animal feeding operation (CAFO) data and information that has never been available before. 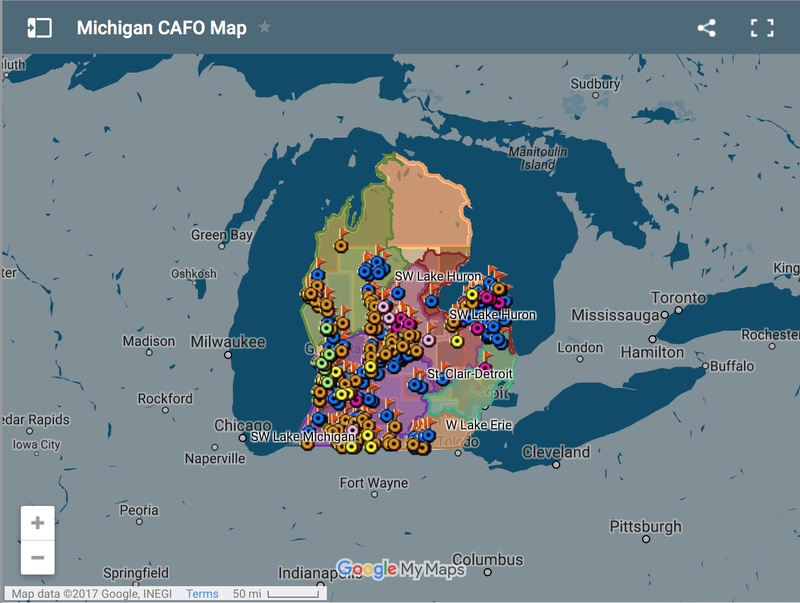 It features an interactive map showing, by watershed and Congressional District, the location of all Michigan CAFOs with National Pollutant Discharge Elimination System (NPDES) permits, and provides several key facts for public use. Using the most current available data, this project includes: the location and the owners of the CAFO sites; the species and head counts of animals housed; the facility’s NPDES CAFO permit numbers; the CAFO operator’s report on waste produced; any environmental enforcement actions taken by the State of Michigan; and the taxpayer subsidies received. You can view the report and associated maps here. The report was picked up by several news outlets, including Michigan Public Radio, which covered the report in their story Drowning in Manure, and media group MLive, which published the article Michigan CAFOs get subsidies despite mounting violations, report claims. Portland, Oregon, May 30, 2017: InFARMation (& Cheese): Can scaling up cheese production be done in a way that is socially and ecologically responsible? 5:30-8:30 pm at the Holocene in Portland. Find more info here. Rushville, Illinois, June 1, 2017: Public informational meeting by the Illinois Department of Agriculture for the Olive Branch Acres 20,000-head hog CAFO proposal near Littleton, Illinois.6:00pm at the Rushville County Courthouse located at 102 S Congress St, Rushville, IL 62681.